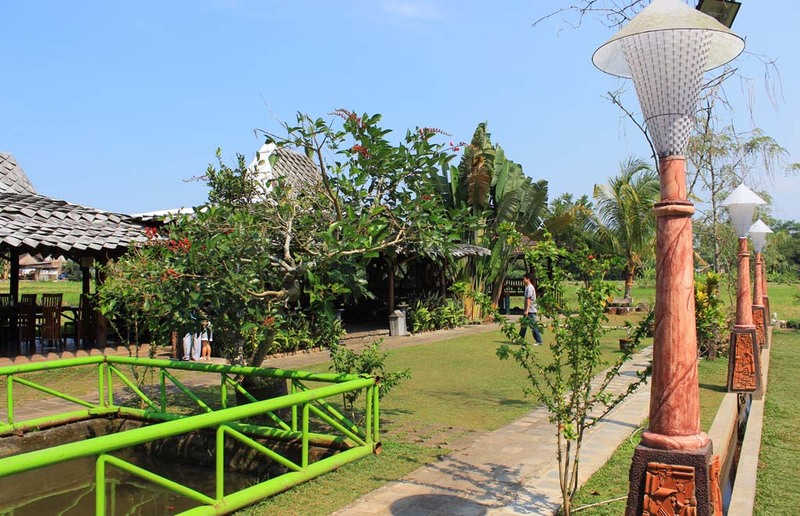 After several nights staying in our hotel in Pemalang, it’s finally time for us to bid farewell to Pemalang. 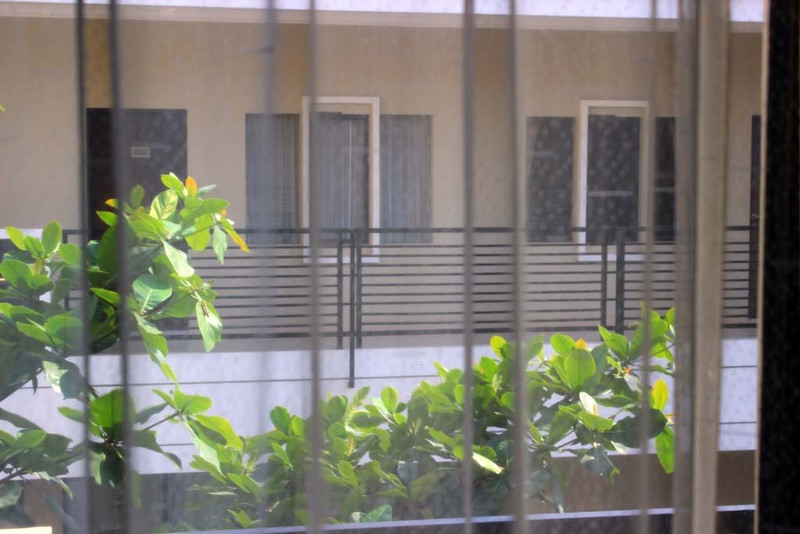 I woke up just after sunrise, and looking out at the window. Well, we stayed so long that there is a some kind of bind with this hotel. After we finished our breakfast, we start pack our belongings and put them inside my car. And just before we left the hotel, I took the picture of the hotel’s façade. It is as artistic as what I see on the internet. But unfortunately, I was quite disappointed by its poor standard of service, and sour breakfast meal. Today’s drive is quite a long one. From Pemalang, we will head to Solo, 230 km away! 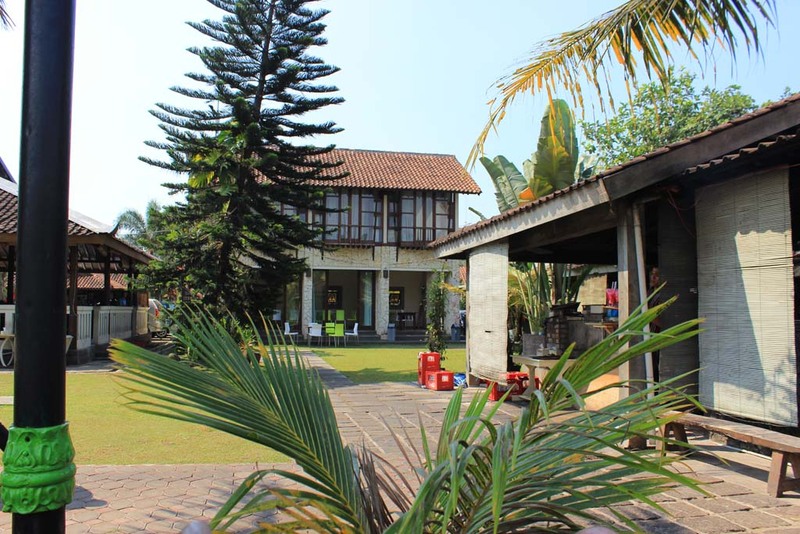 First, Geoff would like to drop by at Batik handicraft center in Pekalongan, where he would like to buy ornate headscarf for his friend back in England. 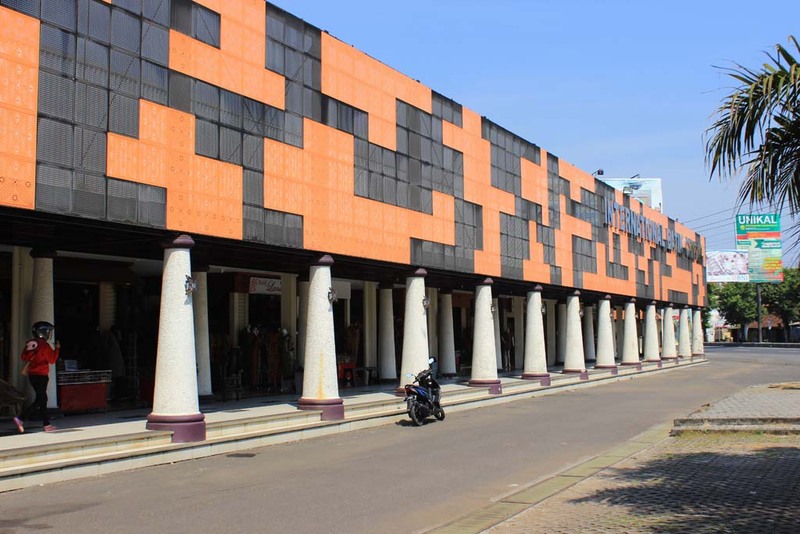 Pekalongan is one of a few place in Java which is known for its Batik textiles. Some could be as expensive as $ 100! But in average it would cost between 5-10 dollars. 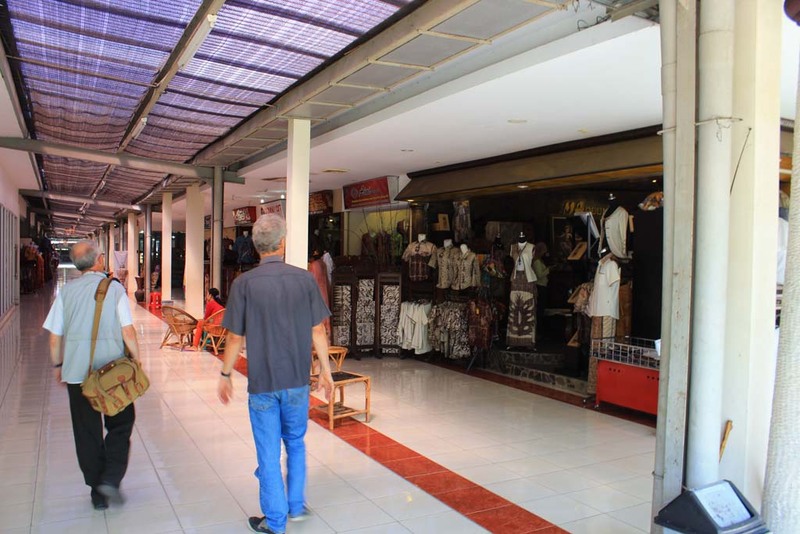 This handicraft center has many varieties of clothing and textile products on display. 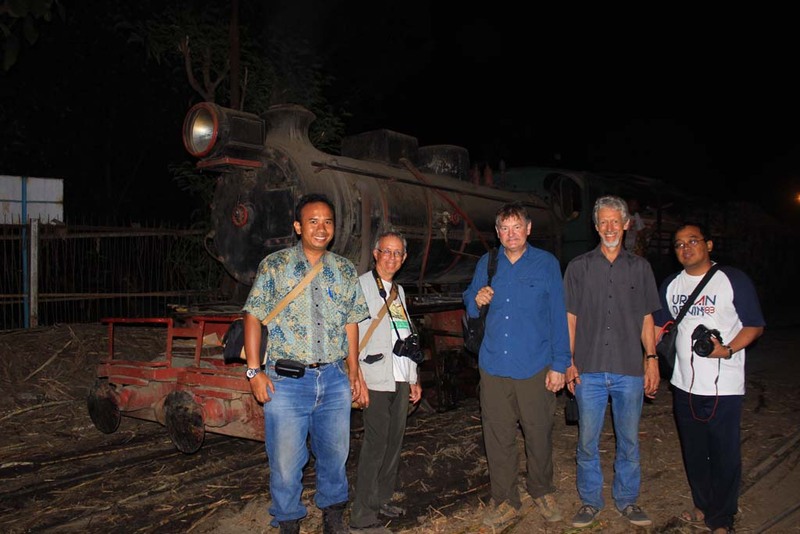 After we bought our Batiks, we resumed our journey. It was a long journey, with occasional traffic jams too. 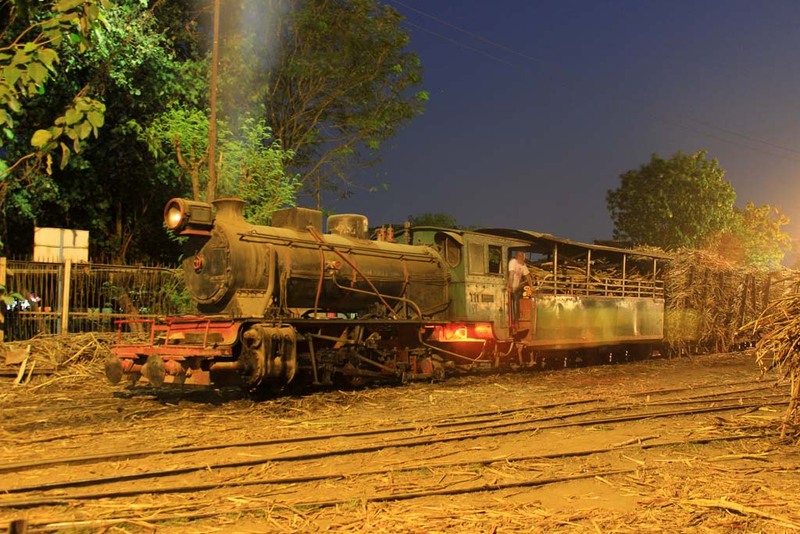 When we passed in front of Cepiring sugar mill, we got caught in a severe traffic jam. But once we cleared Kendal, the road condition improved and we were free from traffic jam. In Semarang , we decided to travel through the toll way to avoid congested city center. Unfortunately the road that lead to the toll way entrance underwent heavy maintenance which lead to severe traffic jams, due to closures. So at one point I had to break the traffic law, and making illegal U-turn just to get to the toll way immediately. Once we entered the toll way, the journey become smoother. 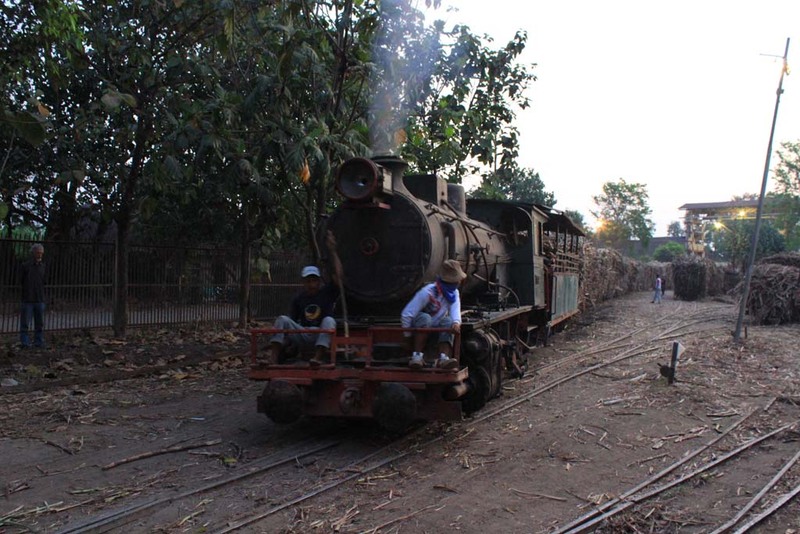 We went through the scenic drive along Semarang’s mountainous south, before exiting at Ambarawa. We didn’t pay to the museum, as we had to rush to make our way to Solo before dark. However, when we reached Salatige, everyone longing for coffee, and my stomach began to rumble. It’s lunch time! 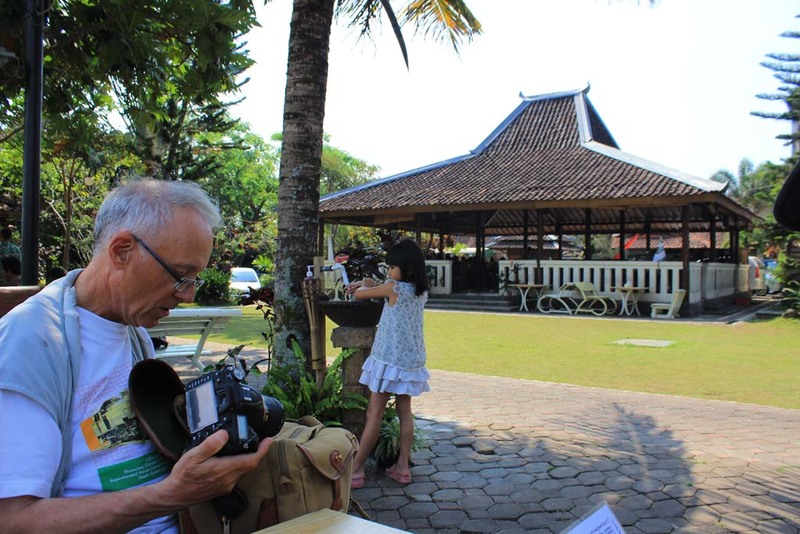 After some debate over where to eat, we eventually decided to go to Warung Joglo Bu Rini restaurant, the restaurant where we had a dinner on our very first night in our trip. It is lunchtime, so the restaurant was busy. Some seats are even reserved. Since it is broad daylight, we could see how the restaurant looks like. 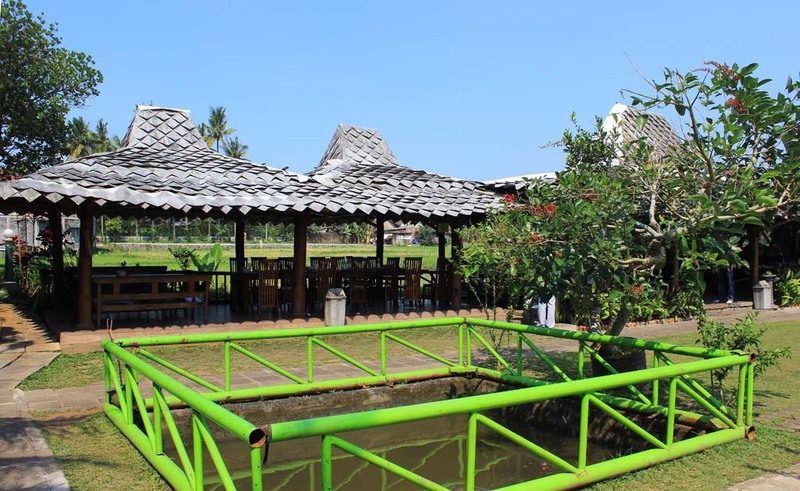 We choose the outdoor seating, so we could see the sceneries. 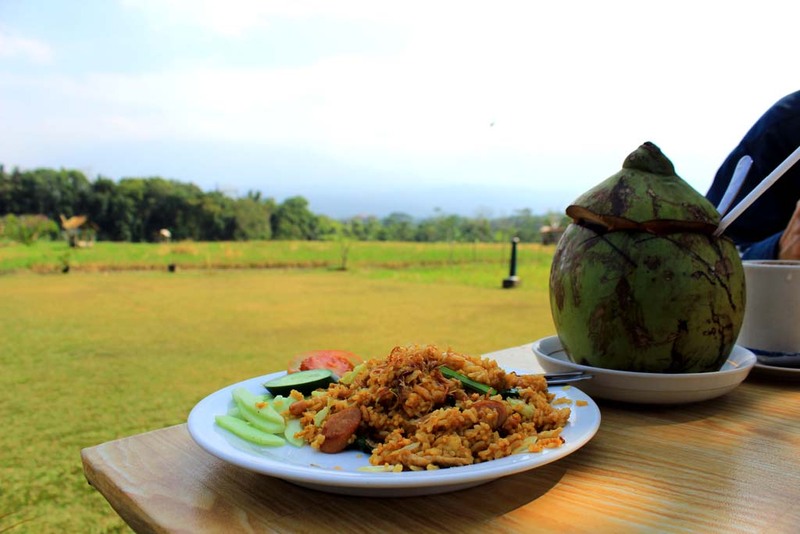 I ordered this Nasi Goreng for the lunch and whole coconut for drink. 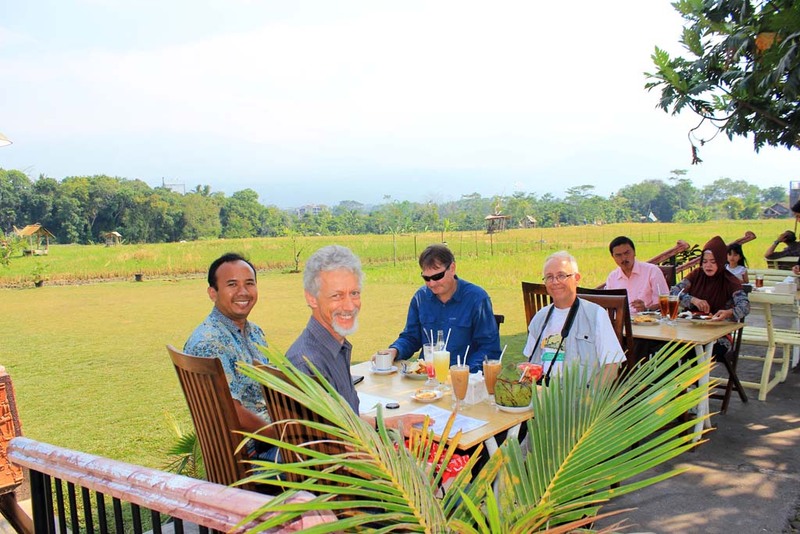 Once we finished our meal, we resumed our journey to Solo. 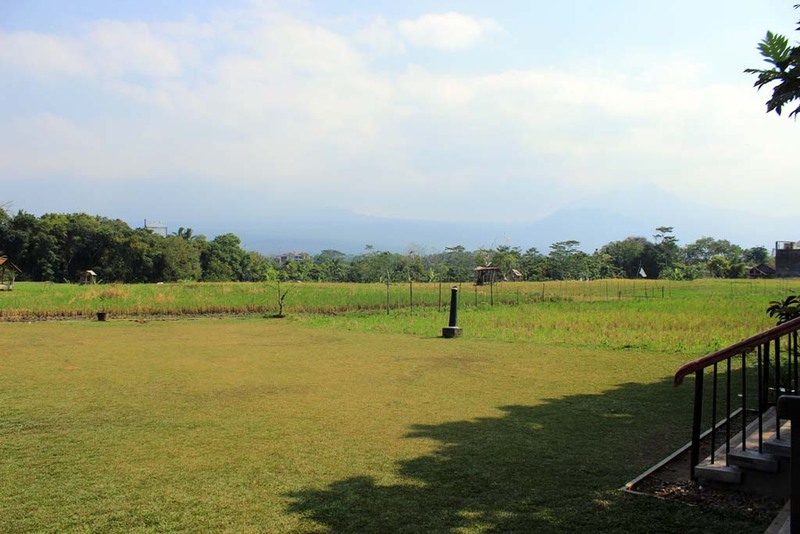 The distance from Salatiga to Solo is not very far. 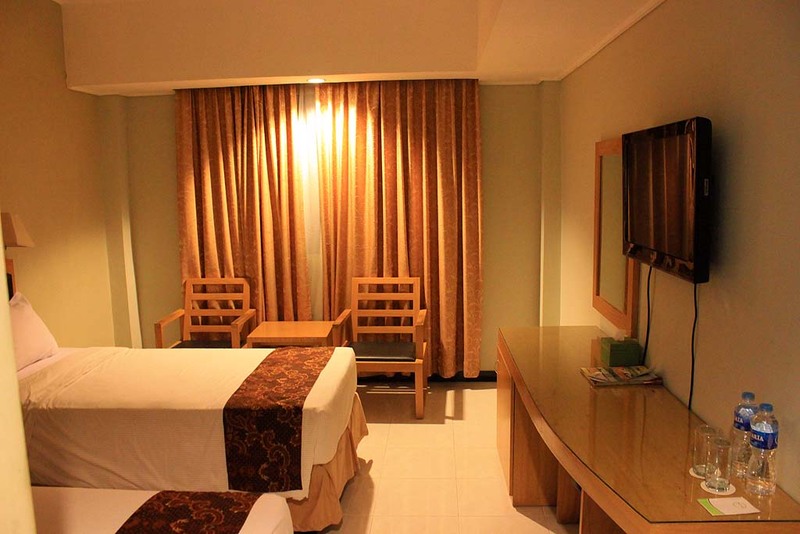 I initially suggest that we ought to check in into the hotel before going to Tasikmadu. But since it was around 2pm, Geoff suggested that we should head straight to Tasikmadu first. So I just drive past Solo, and straight to Karanganyar. 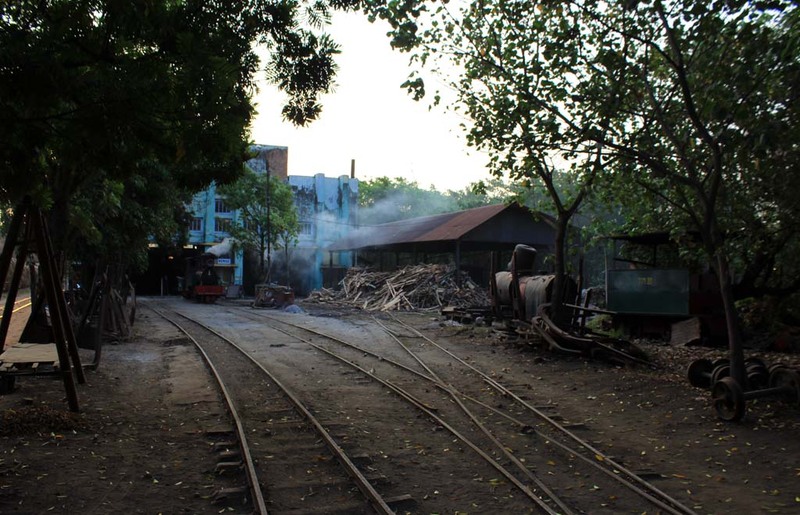 From there we went to Tasikmadu sugar mill. 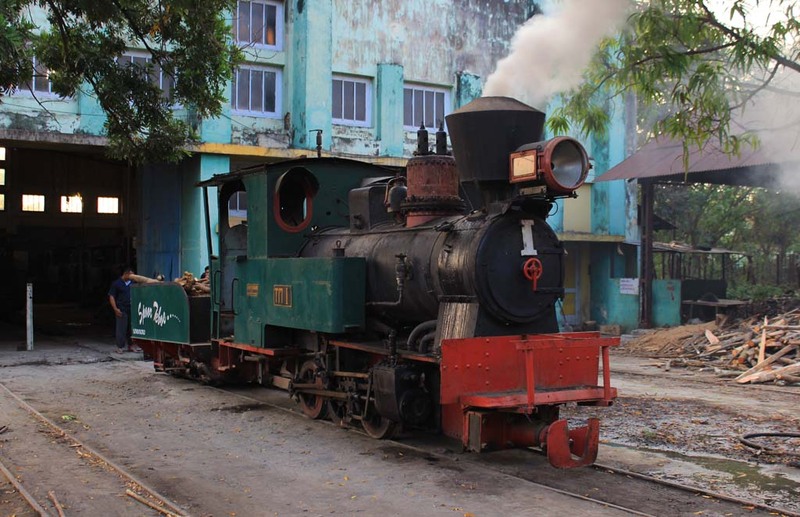 Just like in some previous mills, we came in without permission, and straight to its backdoor, where we went to its locomotive depot. 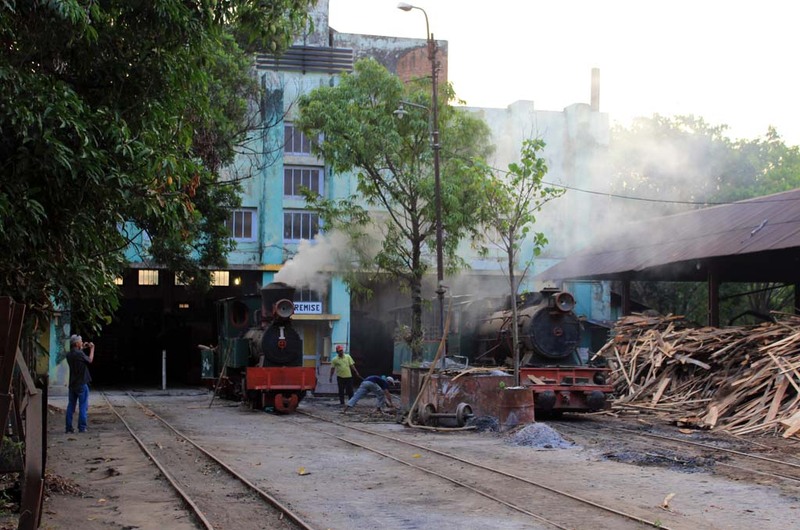 We didn’t initially see any locomotives in the yard, but we can see the number 1 is brewing. 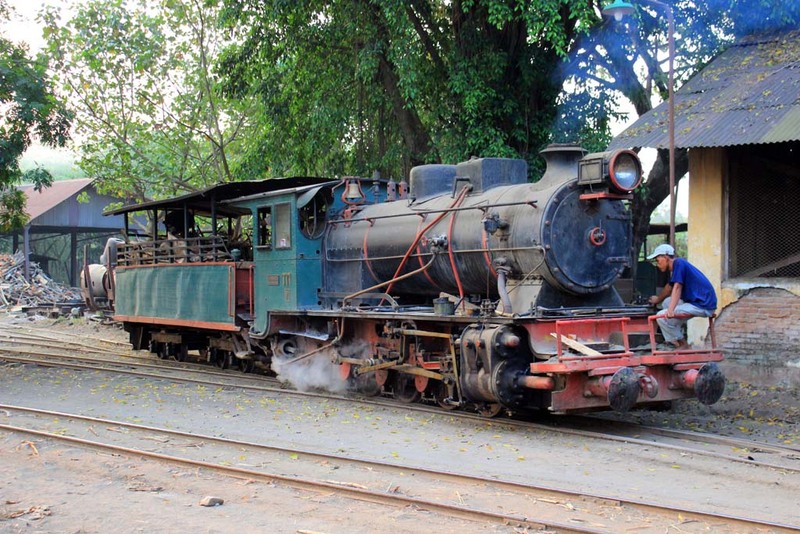 The loco is just one of two steam locomotives used for daily work. 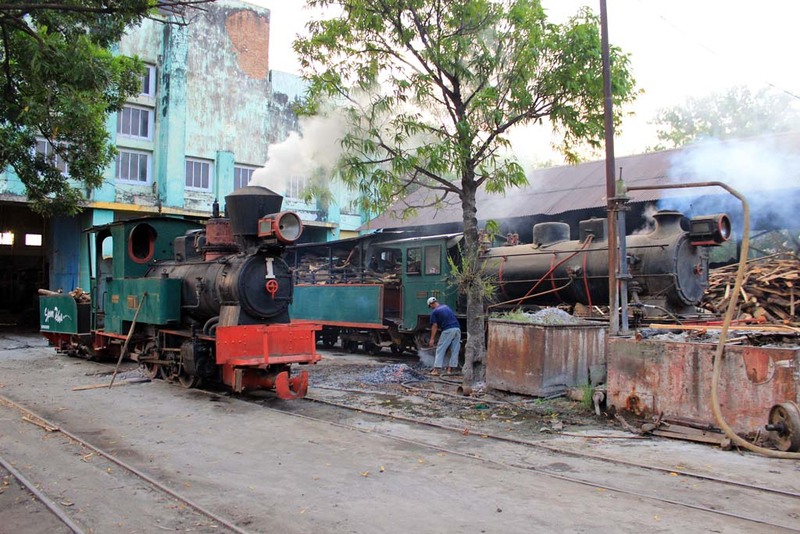 In the weekend they would start another one steam loco for tourist trains. I went to the back of the shed where I came across the famed Luttermoller number 6 (styled in Roman numbering). 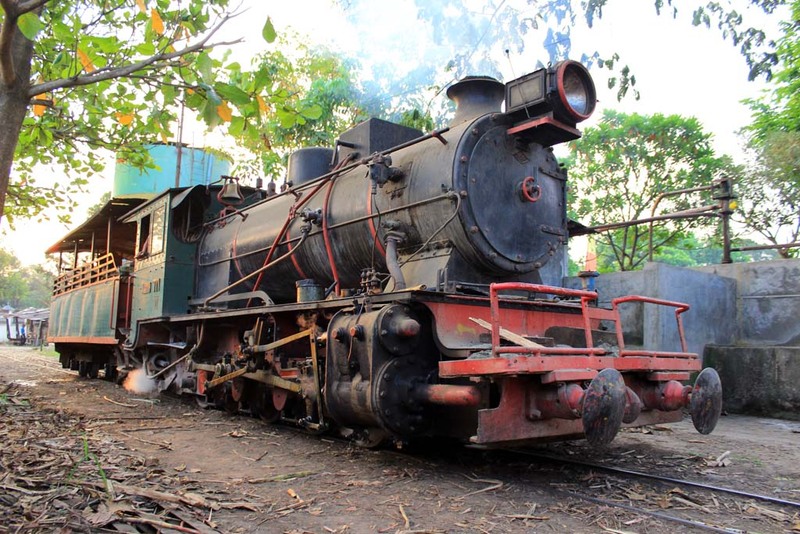 This Orenstein & Koppel built beast is currently the largest narrow gauge steam locomotive still remains in operation in Indonesia. 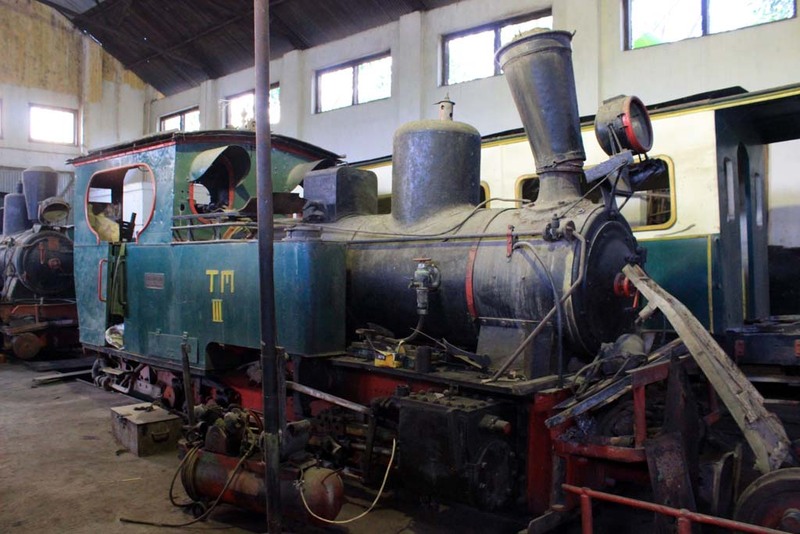 At the height of its service, when Tasikmadu still had their field lines in operation, the loco was said to be able to haul as much as 100 loaded wagons in a single run. 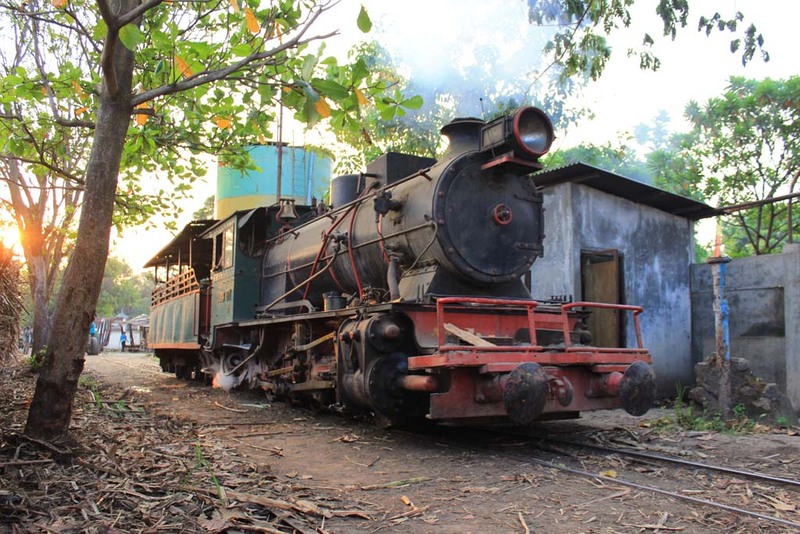 And thanks to its massive tender, it could also travel to Tasikmadu’s outlying field lines, reaching the furthest point and returning back with a long train of sugarcane. 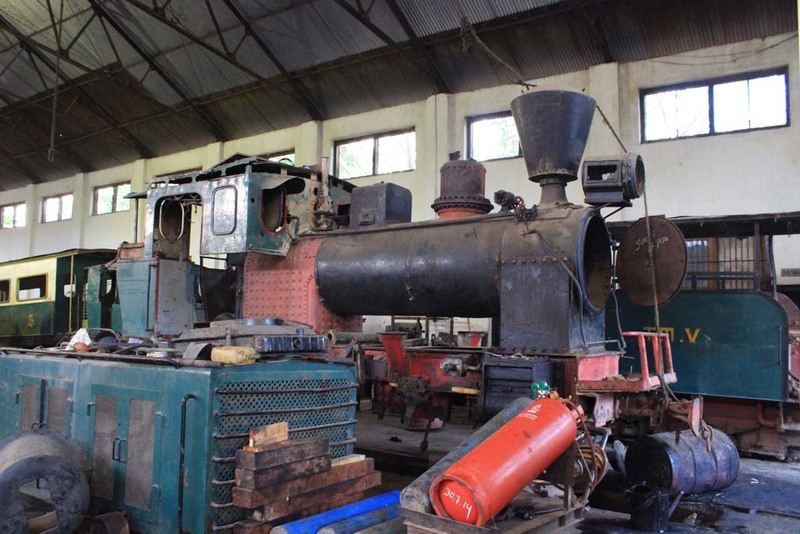 Its boiler able to generate the highest amount of pressure generated by any narrow gauge steam locomotives in Java. 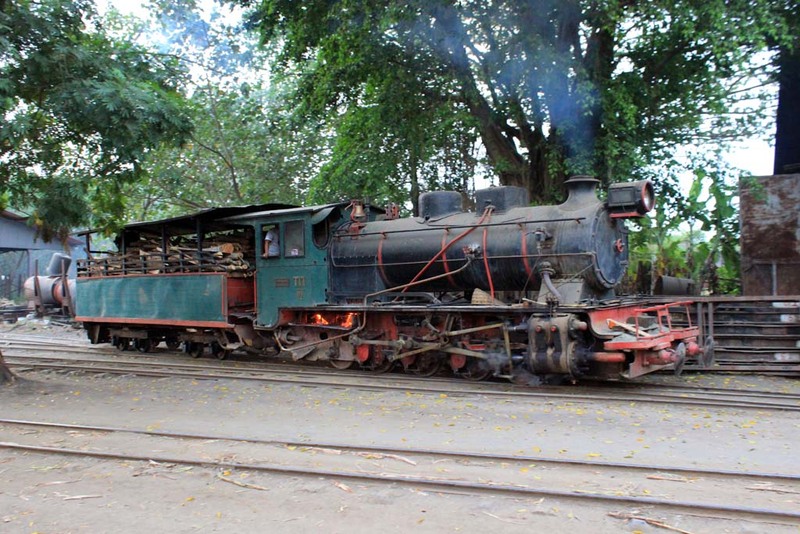 But unfortunately, since the closure of Tasikmadu’s field lines (it happened in segments, but the last stretch was closed down during Indonesia’s severe economic crisis in 1998) this mighty beast is solely relegated for shunting duties. 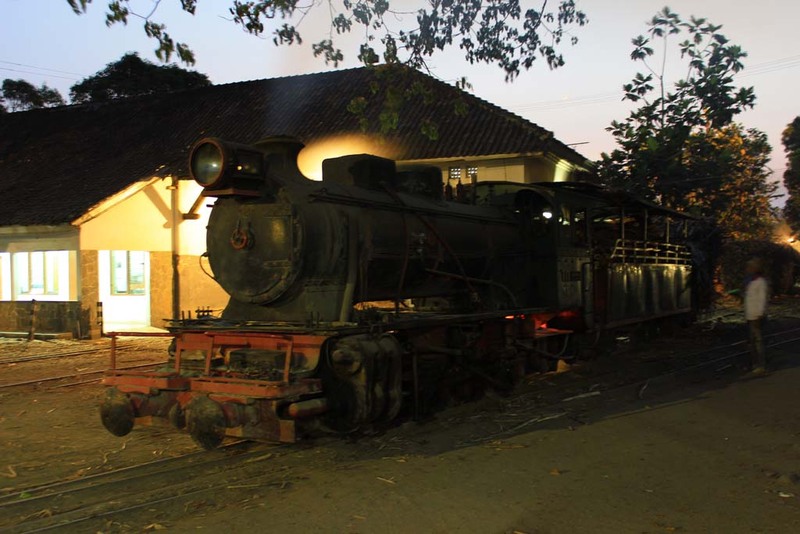 Moments later the locomotive is parked next to its peer in the depot. 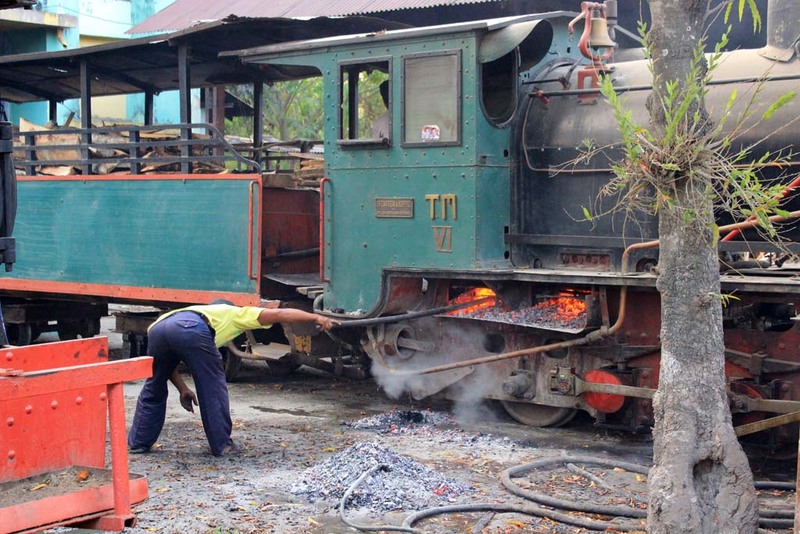 The fireman is busy cleaning up the grate from excess burning wood charcoal. 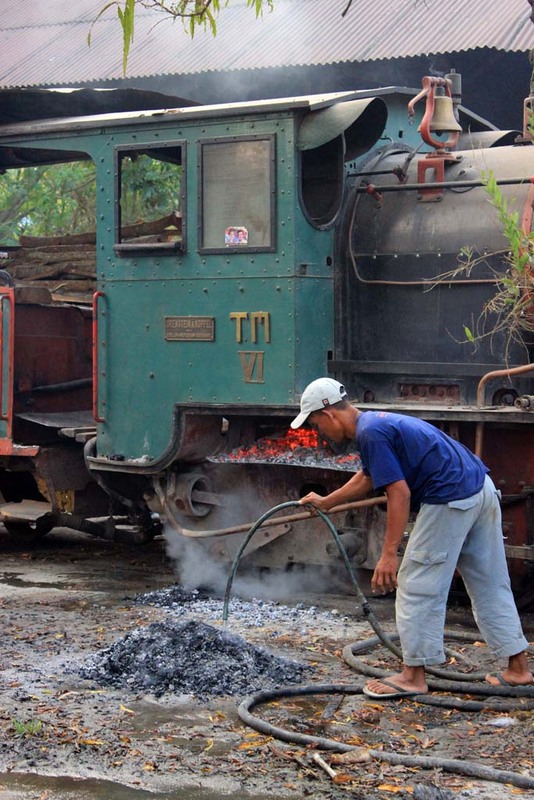 Those excess charcoals would be poured with water to prevent it from starting wildfires. Seeing both of them in steam is just amazing. 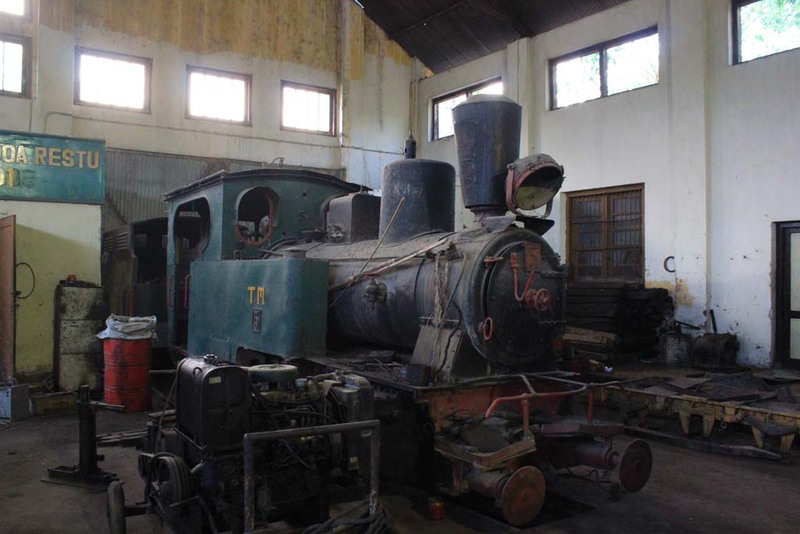 While waiting for the Luttermoller to resume its work, we went inside the locomotive shed. We initially felt hesitant to enter, but since the crew didn’t bother our presence, we just went around. 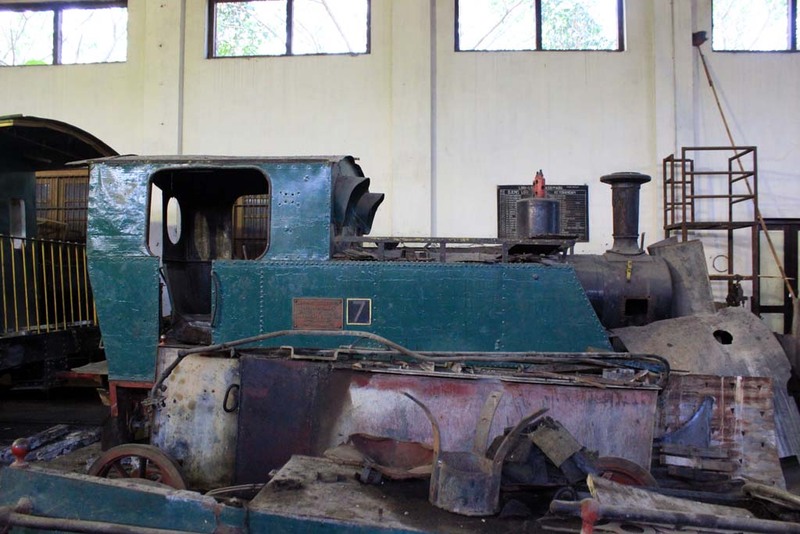 Some locos have already been partly dismantled. 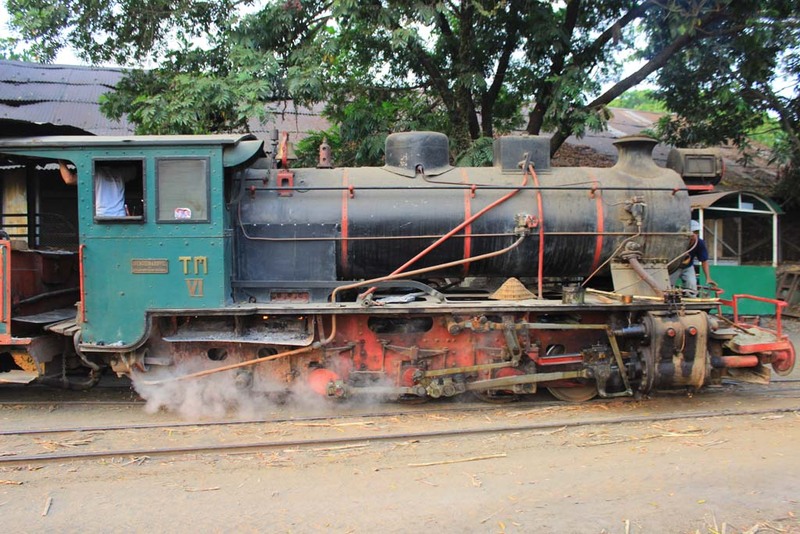 Such as this steam locomotive. The number 3 seemed to haven’t had its wheels running for some years. This one is quite shocking. 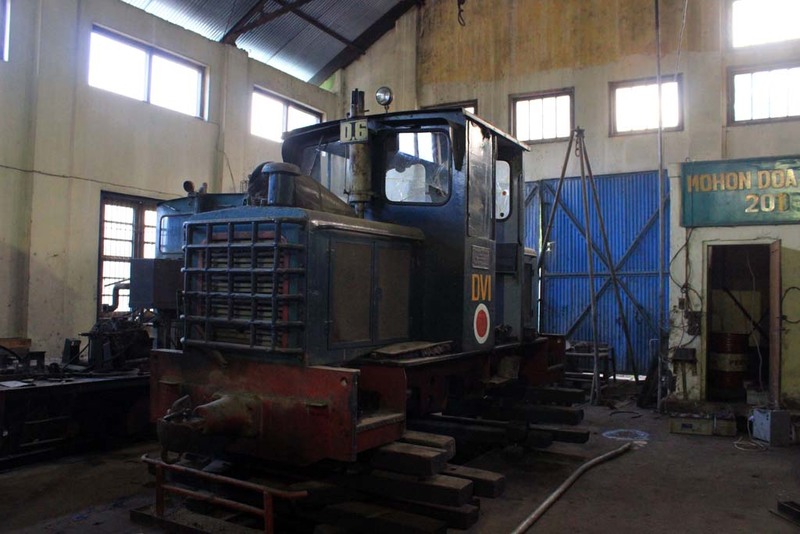 When I visited Tasikmadu in 2012, the Diesel no. 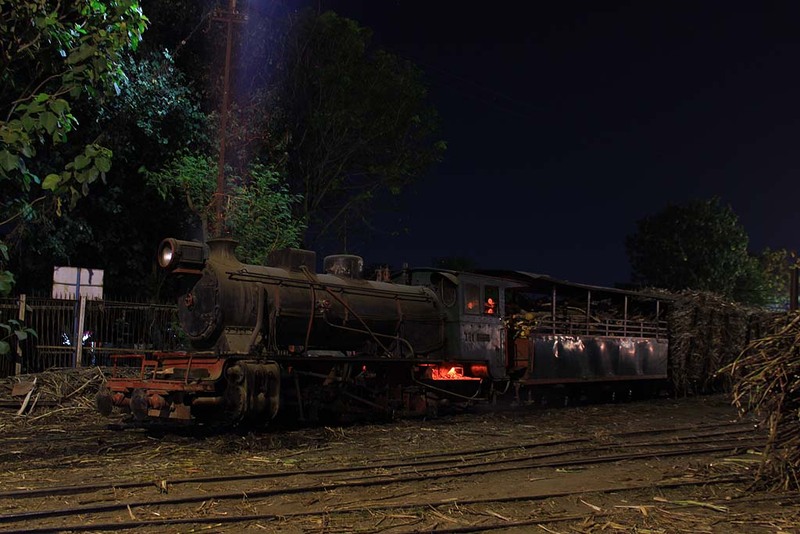 6 was still in running condition. But now it is mounted, and already losing its wheels. Tasikmadu number 5 is quite unique because its number is written in Arabic, instead of Roman numeral. Number 7 also sporting unique feature such as sloped tank. 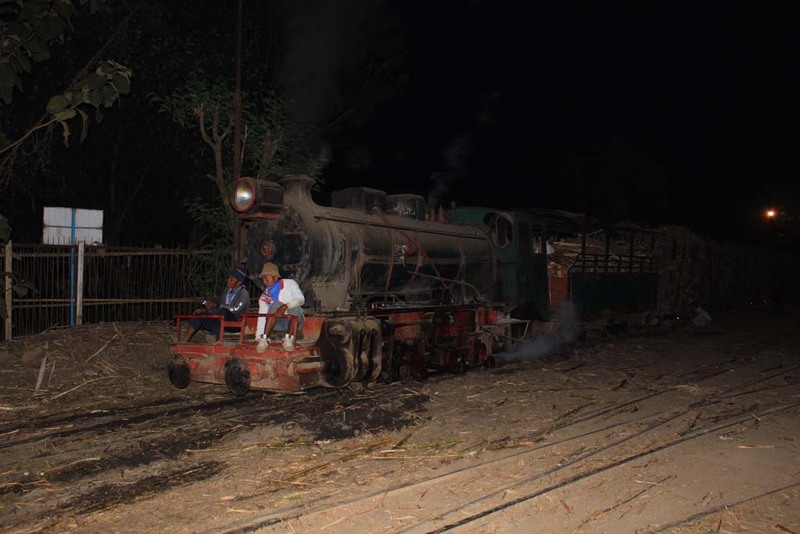 Number 14 is the third steam locomotive in operational running condition, although when we visit the place, it is not lit. 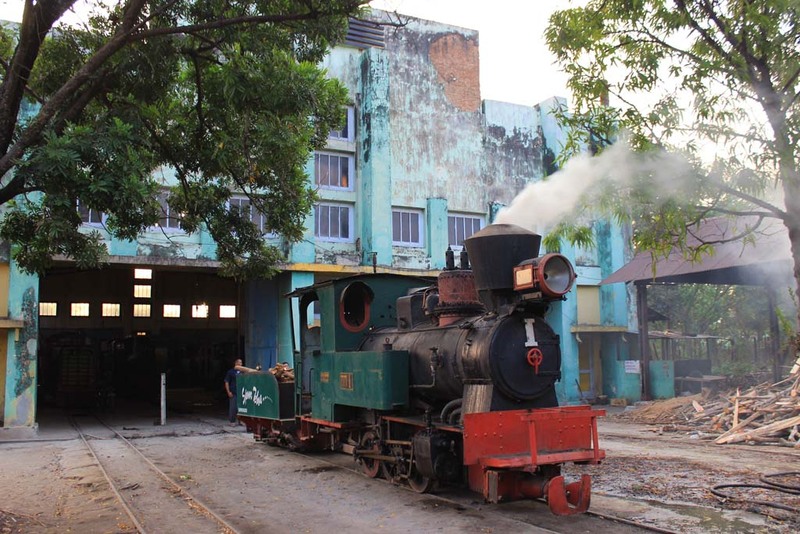 They said that they would only run the loco for tourist train around the mill. I also found this unique rickshaw near the locomotive shed. It is actually a track inspection vehicle. 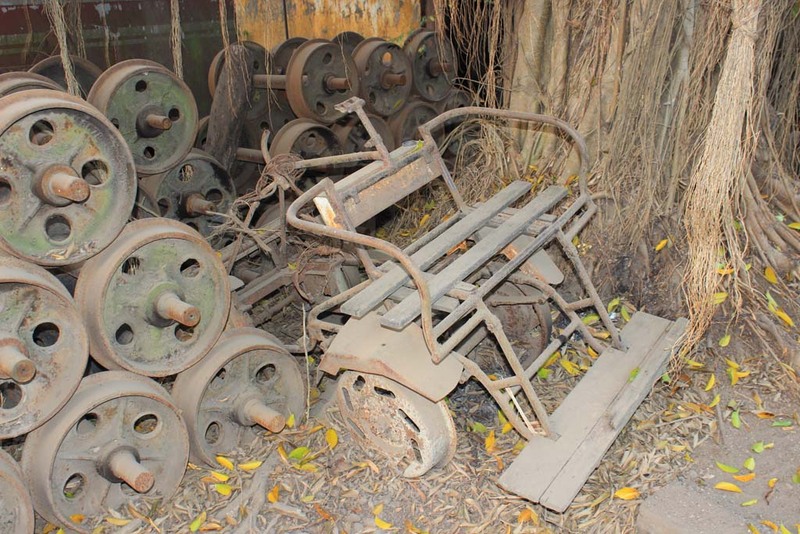 This rickshaw was originally used to inspect the lines. 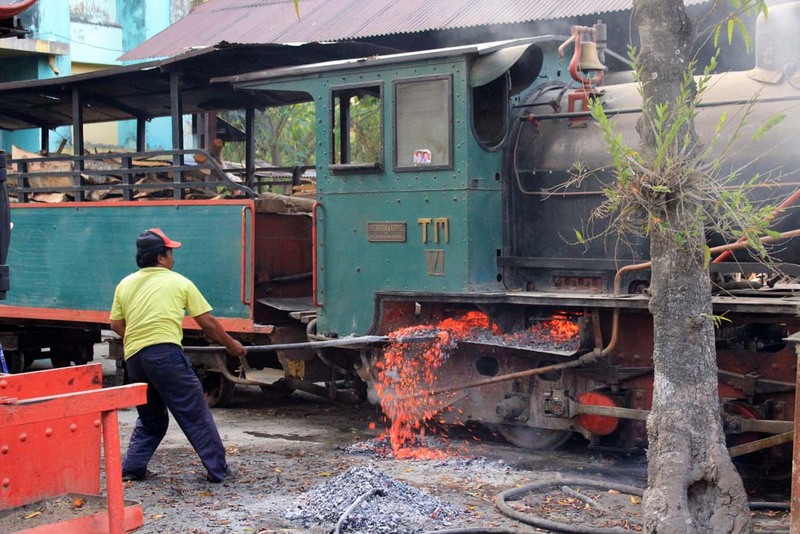 But when Tasikmadu’s field lines were closed down, this vehicle went out of use. It’s getting dark, and the Luttermoller is ready to move. 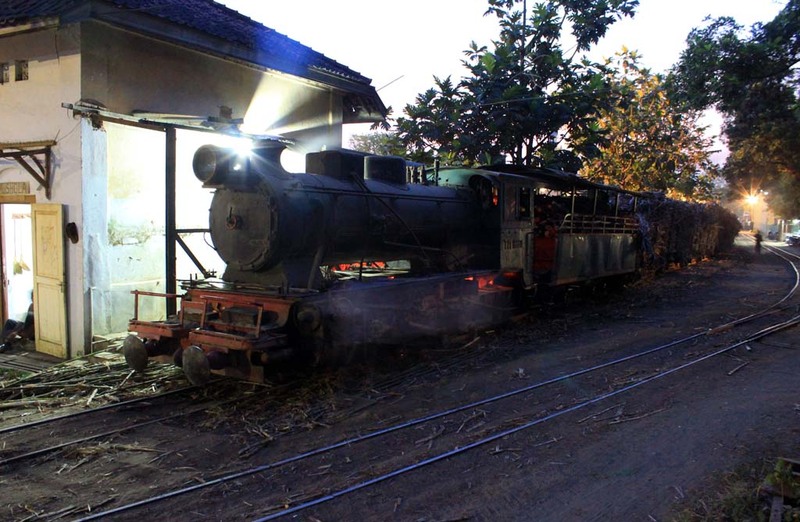 Not long afterward, the Luttermoller resumed its duties…..
…..to shunt the sugarcane wagons. The sun has set, and now it’s dark already. But the darkness didn’t reduce our excitement, and it’s getting more dramatic in the evening. 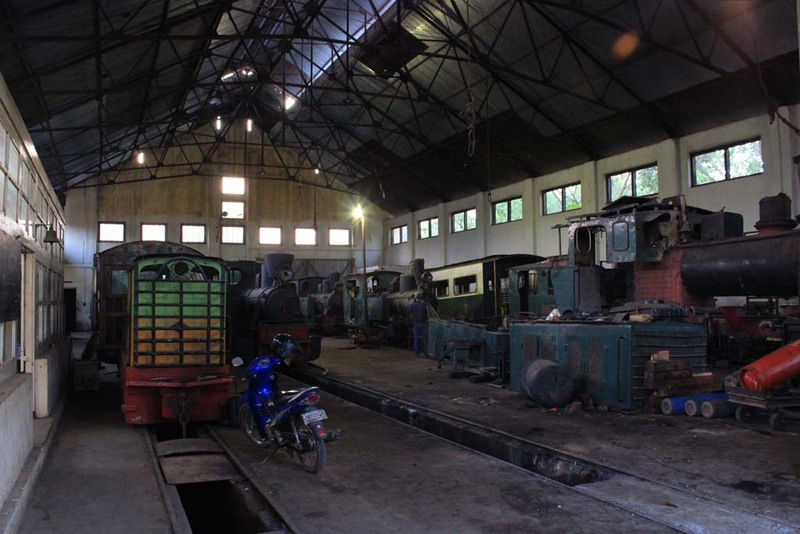 I did call my friend, Ariawan Sulistya, who lives near the mill to join with us doing trainspotting in the mill. He said he will come in a few minutes. 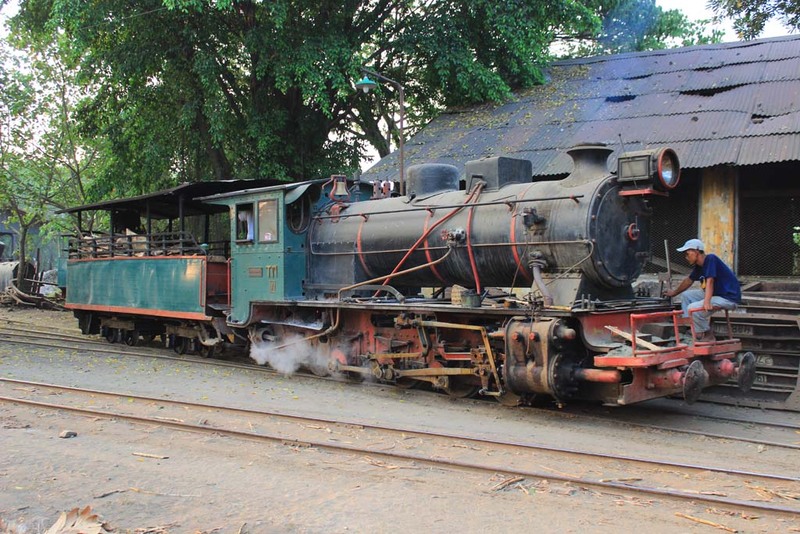 The Luttermoller eventually returned back to the yard. I tried several camera settings to make the great picture of the Luttermoller. While I was photographing the Luttermoller, Ariawan (right) finally arrived at the mill. I introduced him to the other tour participants. 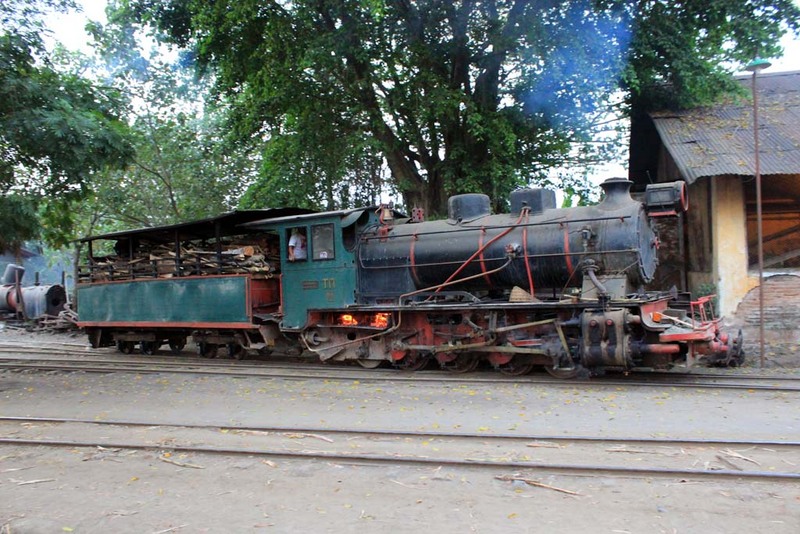 Being a native of Karanganyar, he grew up watching the narrow gauge trains around Karanganyar. 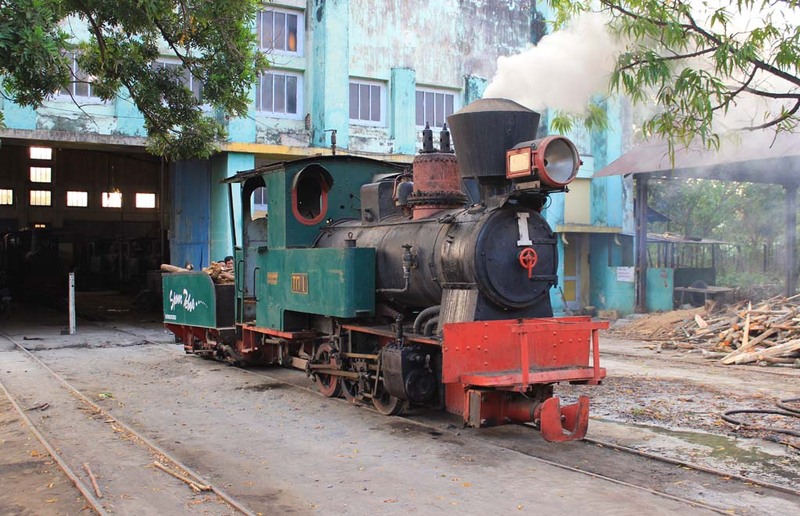 He also have many stories about Tasikmadu’s trains, ranging from fatal accident caused by overloading in 1990, a very long train hauled by the Luttermoller, and his regret for not learning to use camera when he was a kid. 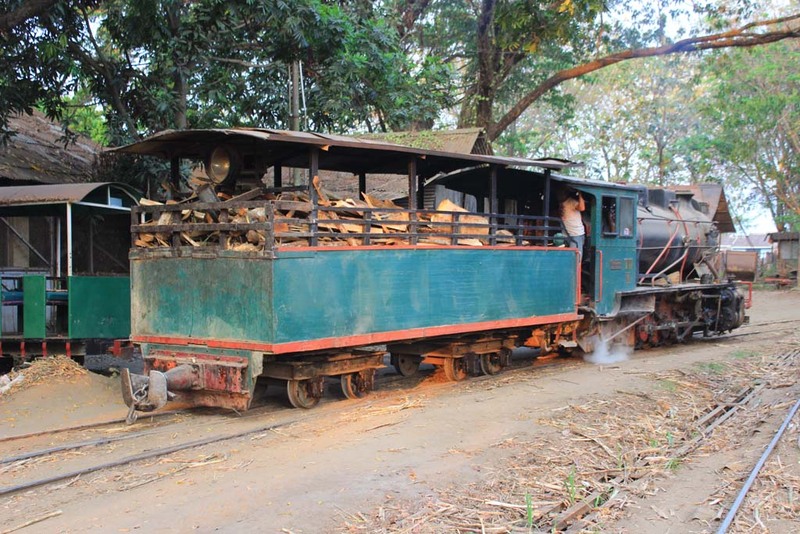 Tasikmadu used to have vast network of narrow gauge lines, as what Ariawan said. Back in 1980s, it cover almost the whole Karanganyar regency. 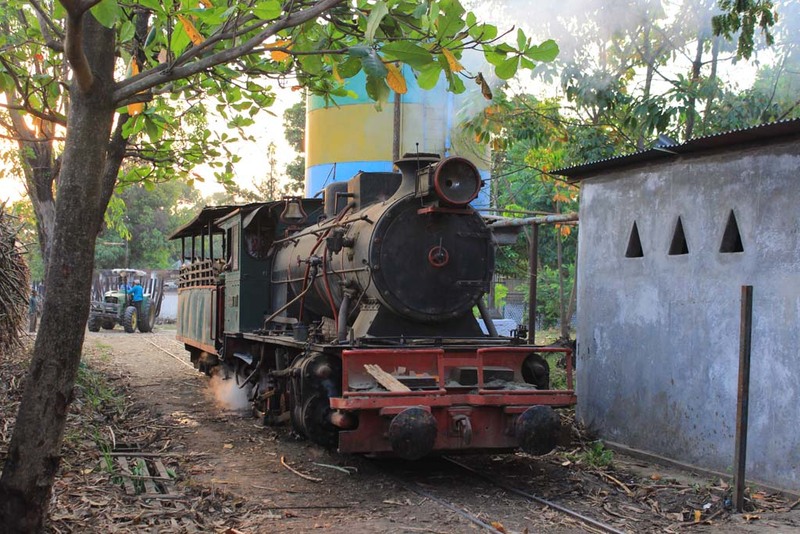 Once in a while his parents would took him to see the narrow gauge trains when he was a toddler. 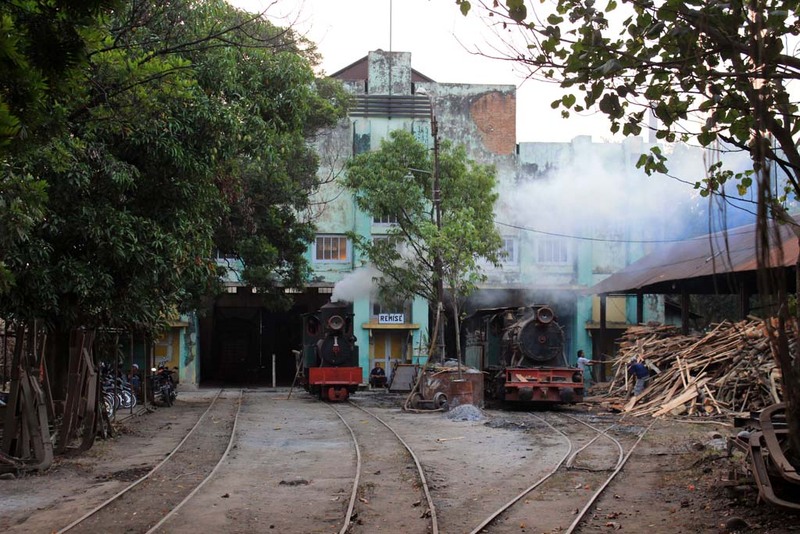 Changes came in 1990s when the lines were gradually closed down, and their service replaced by trucks. The first to be closed down was the line that goes to the East, which was closed down in the aftermath of 1990 fatal accident which killed the driver. 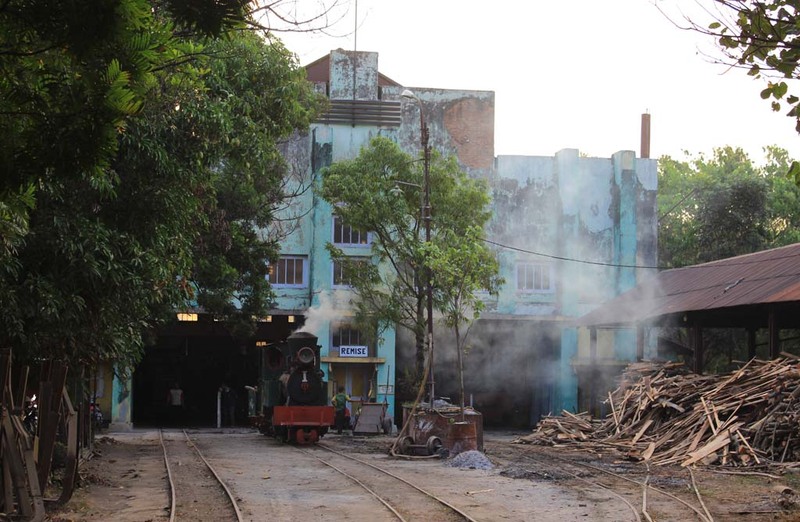 Then, the brunt caused by Asian Economic Crisis in 1997 caused the mill management to abandon all the field lines altogether, the last segment was closed down sometime in 1999 or 2000. 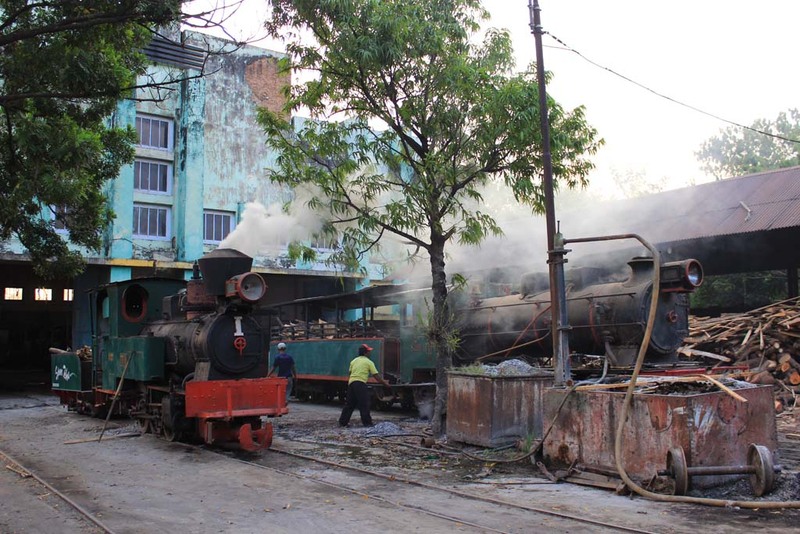 But that was not the end for train enthusiasts who wished to see the locos hauling a train in a mainline-alike running. 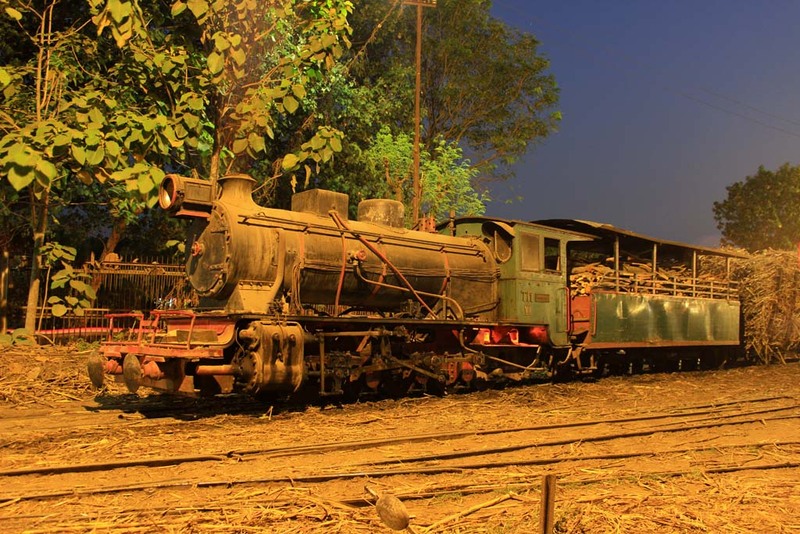 Up until 2009, there was a train work where the locomotive would haul a loaded wagons from truck transfer into the mill. But unfortunately, it too was closed at the conclusion of 2009 harvesting season. 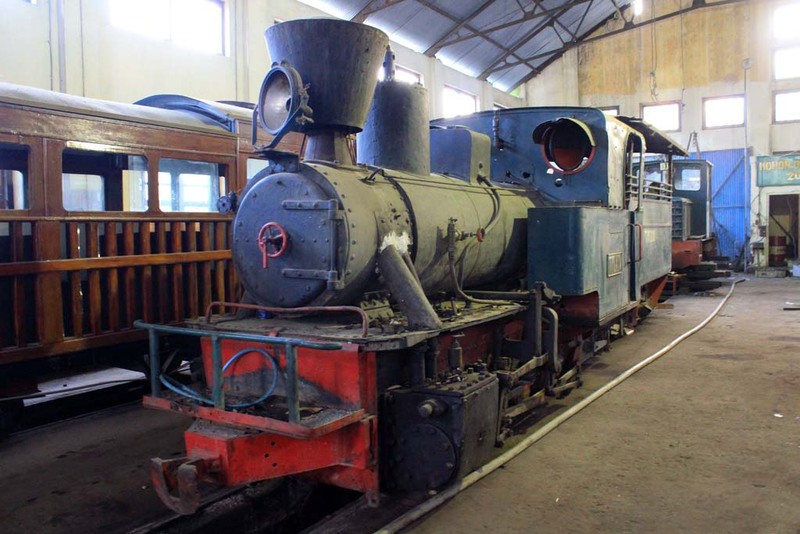 Since then the locomotives would only be used to shunt the wagons inside the mill compound only, including this giant Luttermoller. 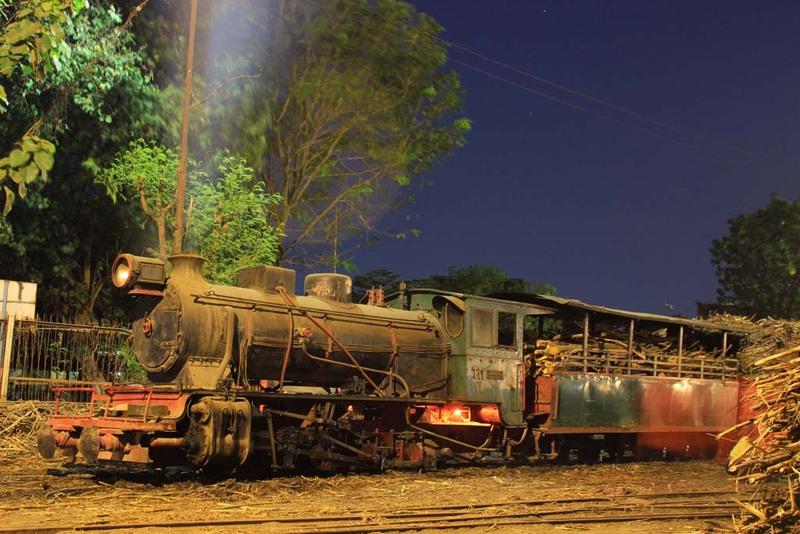 We concluded our trainspotting season in that evening. 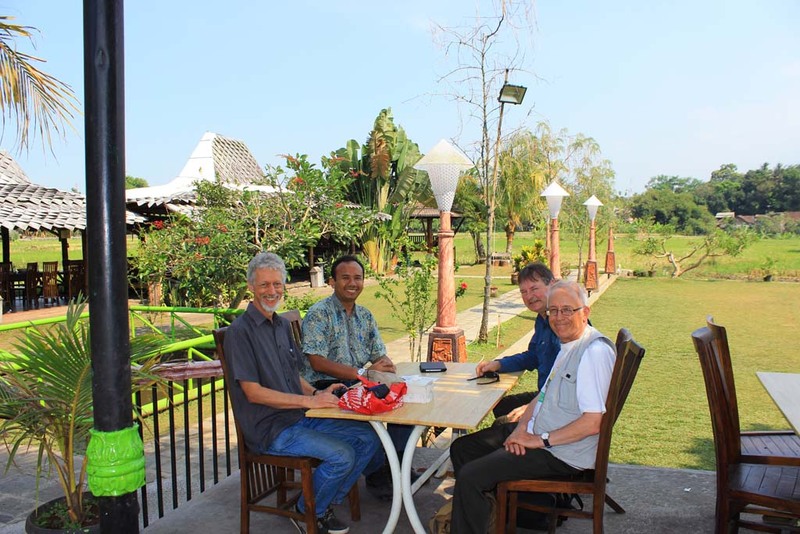 Ariawan bade farewell to us and returned back to his home, while we went to our hotel in Solo. 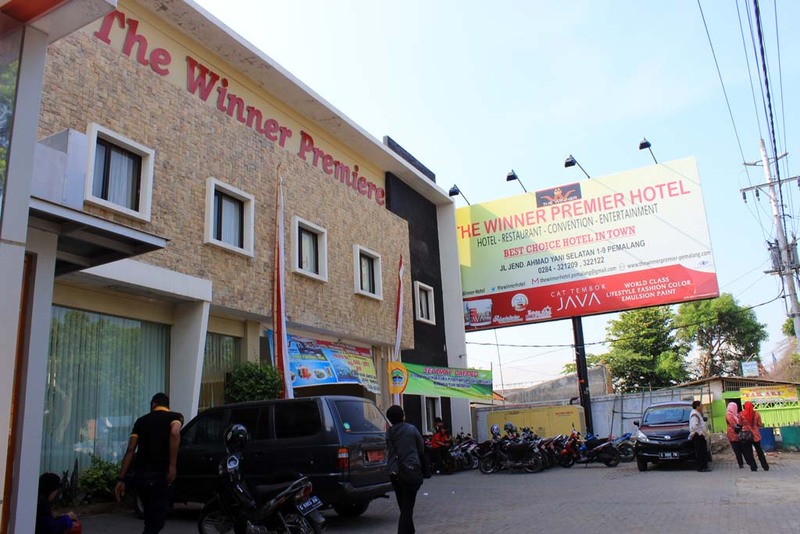 It wasn’t very difficult to find our hotel as it is located just across the road from Solo Balapan hotel. 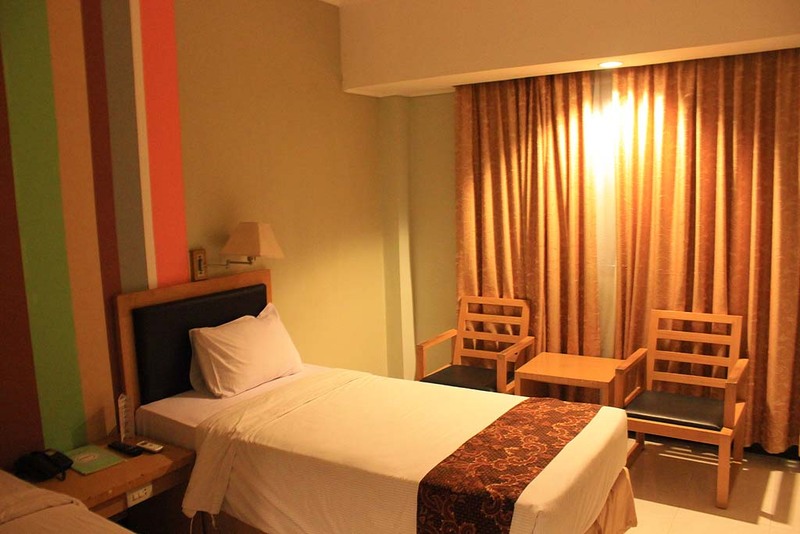 The hotel is a stylish budget hotel, with a modern design. 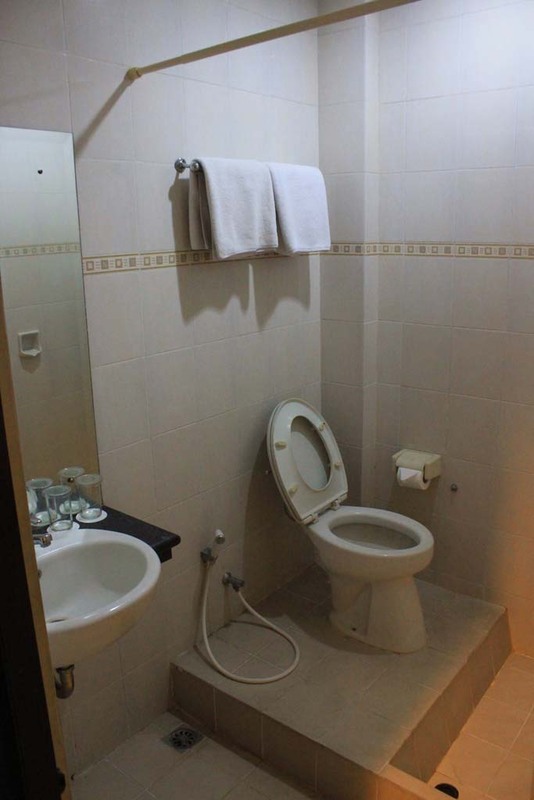 The room looks very pleasant. Geoff told me that he have actually stayed in this hotel before, when it was still in its previous incarnation. He said the hotel was so bad that he decided to check out earlier than planned. But the current version is much better! After some evening meal in a nearby shopping center, we returned back to our hotel and taking a rest after a long drive and trainspotting.